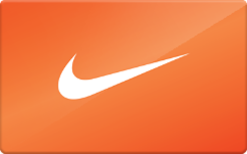 Nike gift cards are redeemable for merchandise at any Nike-owned or Converse-owned retail store in the US and Puerto Rico (if purchased on or after Nov. 13, 2002) and on Nike.com (US). Orders placed on Nike.com (US) are limited to the 50 United States and District of Columbia. Buy a discounted Nike gift card to save money on top of sales and promo coupon codes for the best deal.